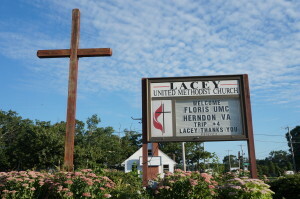 Our New Jersey trip started off on Sunday evening as we all arrived at Lacey UMC in Forked River, New Jersey. Many arrived early (or at least on time) and had a chance to enjoy their first meal together as a team, followed by the first team meeting led by our fearless leader Tim Wells. After some administrative items and a briefing by our construction team, Tim led us in an inspirational devotion about being a good neighbor and the story of the Good Samaritan. It helped set the perfect tone for the next day, as we headed to Atlantic City for our assignment. 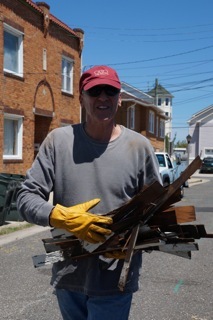 Monday morning came bright and early, and after a full breakfast from our hosts at Lacey, we headed down to Connecticut Ave in Atlantic City ready to spend the week completing an intense dry wall job. However, upon arrival it became clear that God had a very different plan in store for the our team. We were no longer scheduled to complete a dry wall assignment. We were now assigned to removing a heavily damaged roof, and the demolition of a damaged and unsafe garage that had taken in over 3 feet of water. The homeowner Elise, and her son Tru have been in urgent need of a new roof since Sandy struck almost a year ago. While the team had very little expertise in the area of roof removal and rebuilding, what we lacked in skill we made up for in willingness and a heart for helping get Elise and Tru the roof they needed to be able to move forward with the additional repairs that need to be completed on the home. We quickly divided into two teams, those willing to get up on the roof, and those who preferred to have two feet firmly planted on the ground! As the roof team geared up with harnesses, the other team headed to the garage. For the rest of the day, the roof team worked to remove the shingles from the damaged roof, while the garage team cleared out the garage, and started tearing down the building. 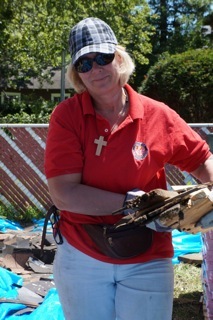 By the afternoon, the garage had been leveled, and about one-quarter of the roof had been cleared of all shingles. A large rotted section had been replaced with new plywood to help alleviate some of the leaking the homeowner was experiencing. With 5 p.m. quickly approaching, efforts shifted from the garage area, to clean up of the old roof shingles. The roof team worked to get a tarp covering the exposed roof boards in the event there was rain overnight. Finally at about 6 p.m., tired, dirty but accomplished the team returned to Lacey for dinner and another team meeting. Monday evening dinner was pasta, pasta and more pasta – just what we needed to recover from the challenging and demanding work of the day. After our meal, we joined for our evening team meeting to reflect on the day, and plan for day two. Lee led us in the evening devotion, and asked the team where they saw God or Jesus that day. Several people shared their experiences of the day, and we all could feel God working with us to create something special for this family. Ten was lights out, but most of the team was fast asleep well before that time. Day two started out much the same as day one, with another great meal provided by Lacey! Following our meal we again headed out to Atlantic City for day two. The teams quickly divided again, with the garage team focusing on the remainder of the garage demo, while the roof team continued removing the damaged shingles and replacing rotten sections. By lunchtime, the garage was done with the tear down and removal, and moved on to a new project of creating a new driveway for the homeowners. The roof team made significant progress, and by the end of the day the first half of the roof was cleared just in time for the rain to start! As the teams joined forces to quickly clean up the space, and replace the tarp to prevent any additional rain damage to the home. The team returned from day two, much dirtier than day one, but also much more inspired and eager to move on to day three. The team meeting tonight came early, with Tracy, Jecen and Reagan offering the devotion. 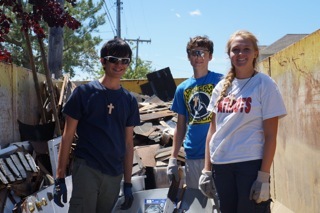 The "trio" (mom and two teens) was on their first mission trip with Floris, and each shared what they were experiencing on the trip. A reminder to trust in God, the realization of how great teamwork can be, and a first experience of feeling the peace and joy of doing work for and with others were shared. Many others also talked about how God was continuing to provide for the team, and most importantly for the homeowners. With tired muscles and exhausted bodies the team headed to bed, exhausted from the day, but filled with the power and strength only God can provide as we head to the third day! The post Teamwork and Roof Removal: Sandy Relief Mission Team Update appeared first on Today I Saw God.